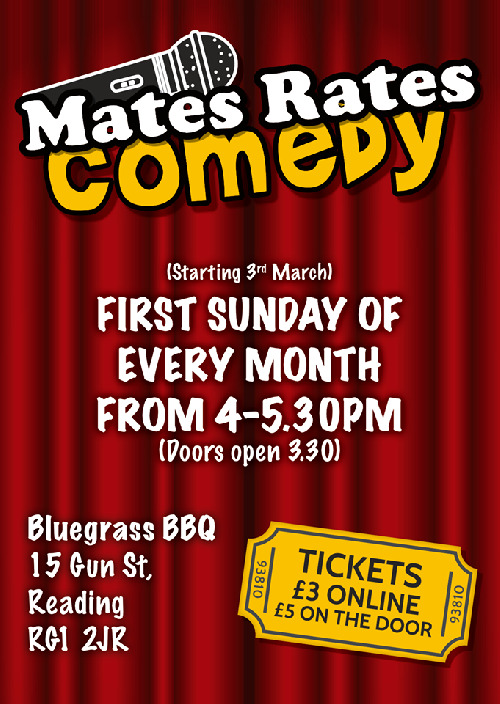 The purpose of Mates Rates Comedy is to provide a space for new acts in Reading to give stand up a go while also having enough quality to build and retain an audience. -If you are applying for the headline spot please send across a video, your comedy CV and preferred fee. While I won’t be censoring acts, I do ask that you please read the room! It is a Sunday afternoon show so I want to try not to alienate my audience. For example I don’t think people will be ready for the C-bomb. There is no obligation to promote the event on social media, and your respective platforms. However, it is encouraged and genuinely appreciated if you can do your best to build some momentum for the night. -The headline act will be paid. -All acts are offered a free drink. Nicholas Byard has 2 spots available. Click here to apply.